Bubble (Zorb) Football is a crazy new game that is taking the world by storm. Just like in a regular game of football the team that scores the most goals wins, but in this bizarre variation of your favourite game everyone will be wearing huge plastic inflatable balls and fouling another player will be met with laughter and applause instead of a telling off from the ref. The mayhem starts as soon as the whistle blows with everyone charging and crashing into each other as they try to control the ball or put in a tackle. Your stag party will be creased up as they witness good and bad football players alike being bumped and bounced all over the place and rolling upside down with their legs in the air. At the same venue are other events you can pre-book such as Old School Sports Day, Turbo Cricket, Inflatable FootDarts, Extreme Dodgeball and Battle Archery. Why not book 2, 3 or 4 back-to-back events? 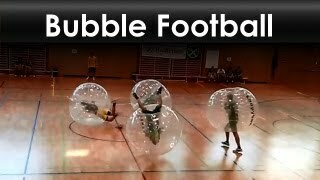 View our Bubble Football video and get an idea of what to expect on this activity.